This report focuses on the affluent consumers of Singapore. They are Singaporeans who have an annual household income of at least SGD$135,000. They represent the top 30% of resident households in Singapore, with 18% earning at least SGD$250,000 annually. This is indicative of the Singaporean’s large capacity to spend, and the potential for luxury goods in this market. 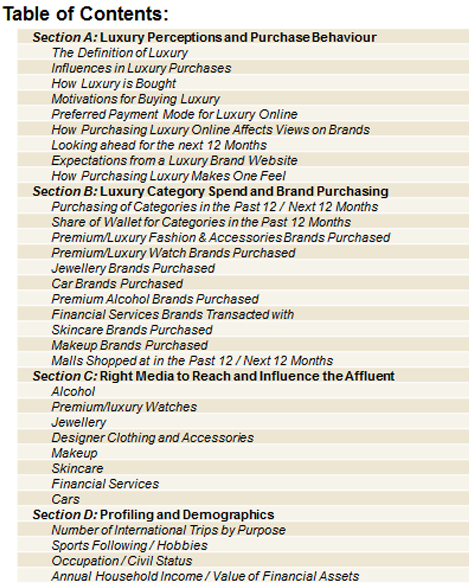 To better understand this segment, we looked into the purchasing behaviour, motivations, media channels, and brand preferences of these affluent consumers in the context of premium and luxury products and services. We also shed light on the most effective influencers and motivators behind purchases in order to better target the segment and attract new customers or increase spending from current customers. Interviewing over 300 affluent respondents with a minimum annual household income of SGD$135,000. Over 100 of these respondents are High Net Worth Individuals (HNWI), with minimum US$ 1 million in investable assets.